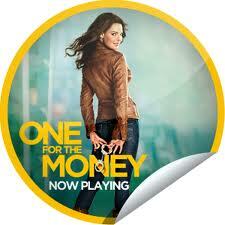 On opening weekend, Chickadee and I went to see the One for the Money movie. It is based off the book by Janet Evanovich. We love it when books make it to the big screen. The fun part is matching the scenery and characters to what was written. Let's break down the cast. I love Katherine Heigl. I am one of the few Grey's Anatomy fans that miss Dr. Izzie. She's a good actress, funny and can adapt to any character whether serious or comedic. I was disappointed in Stephanie's father because he spoke. Dude! You're just supposed to just sit there, give an occasional side eye, and eat quietly. And Stephanie's mother never ironed or drunk alcohol. But other than that, the cast was on target. Grandma Mazur (played by Debbie Reynolds) was a pistol...literally. I would have liked for her to crash at least one funeral though. Sherri Shepherd played Lula. During an interview, she mentioned seven years ago she read the book. She put on her vision board that one day she would play Lula. 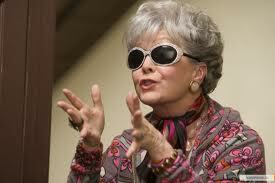 And let me tell you, nobody could play Lula better than Sherri did. The wig, the clothes, the donut eating, all well done! Morelli was played by Jason O'Mara. Meh. I expected differently. But Daniel Sunjata as Ranger? Hey boo! The script was true to the book. If you're a Stephanie Plum series reader, check out the movie. You are guaranteed a laugh and entertainment.